I have to concede this is part of ColdFusion I have never looked at. He didn't get any useful responses over night, so I decided to check whether I could either confirm the behaviour he was seeing, or declare "works OK on my machine". 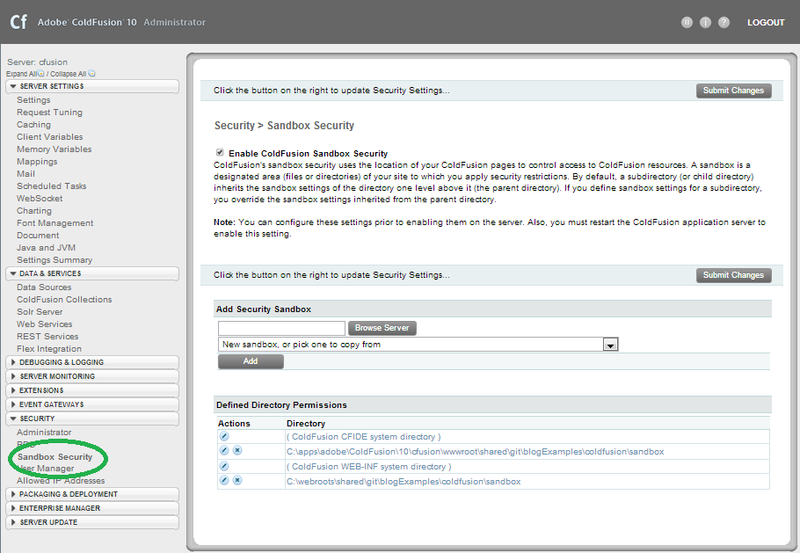 I switched that on - necessitating a ColdFusion restart - and set up a sandbox dir. I created it in C:\webroots\shared\git\blogExamples\coldfusion\sandbox (this becomes relevant, shortly), and for that directory switched off access to all the tags and functions which one can monkey with (it's not all of them, for some reason: Adobe second-guessing what we want to do again, I guess). This was in the above dir. and the code should not have access to the parent directory. So I browsed to test.cfm and... it ran as per usual. Hmmm. So on the face of it, this would bear out what Russ was seeing. However I was not yet convinced I actually knew what I was doing. So I cranked up CF9 and did the same thing, and that didn't seem to work either (ie: the code still ran fine, rather than being blocked)! So I was doing something wrong. This is just the easiest way I know of of having all my CFML instances / installs accessing the same dir on the file system. However this is a fairly low-level file system operation, so I think it's completely legit for CF to not realise that when I told it to sandbox C:\webroots\shared\git\blogExamples\coldfusion\sandbox, that that's the same directory as what it knows as C:\apps\adobe\ColdFusion\10\cfusion\wwwroot\shared\git\blogExamples\coldfusion\sandbox. Java doesn't see the difference either. Having a look around there's probably some stuff in java.nio.files. * which might help with this, but I don't care enough to find out. Security: The requested template has been denied access to expandpath. Security: The requested template has been denied access to getbasetemplatepath. Security: The requested template has been denied access to directorylist. Security: The requested template has been denied access to C:/apps/adobe/ColdFusion/10/cfusion/wwwroot/shared/git/blogExamples/coldfusion. 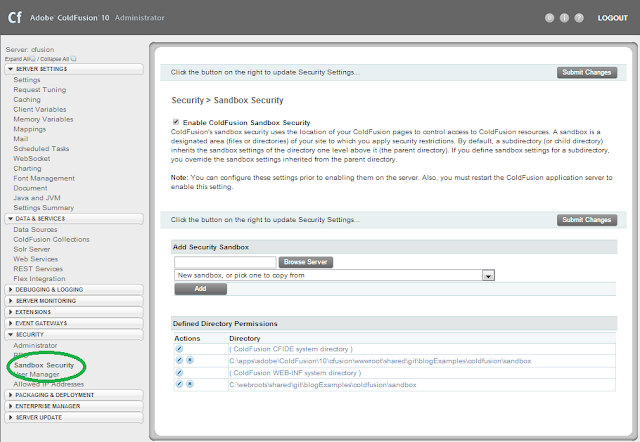 So I'm confident that at least at a superficial level, ColdFusion 10 sandboxing works. Have any of you lot had much experience with sandboxing, and perhaps can help Russ? (If he still needs it, that is).